A fisherman from South Dakota invented the bottom bouncer a few decades ago, and it was arguably one of the most notable changes in walleye fishing we’ve ever seen. 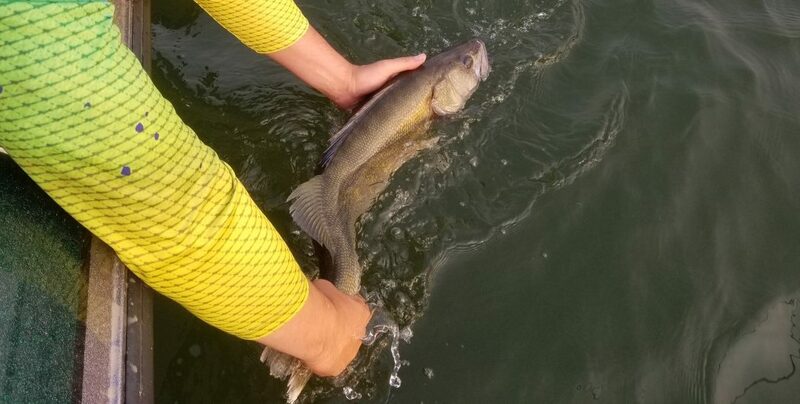 There are so many ways to fish bottom bouncers, making it one of the most versatile tactics for walleyes and other species. Bottom bouncers can be used all season long and can be used to tap into any walleye’s mood. I will break down the 101’s of fishing bottom bouncers, from spring to fall, and the presentations I use to catch big walleye when it counts. It keeps the bait always near the bottom, or at a depth I choose. It allows you to go shallow or deep in an instant, making depth changes easy. I mean, all you have to do really is hook up a rig to the bottom bouncer and go. But is it really that simple??? Not really. I will explain. The first rule of thumb when deciding what size bottom bouncer to use is dependant on the depth and speed you’re going. They say 1 ounce per every 10 feet of water you’re fishing (depth-wise). So if you’re fishing around 20 feet of water, for example, you should be using a 2-ounce bottom bouncer weight. I like to stay a bit on the heavy side, especially when I’m fishing the front of the boat. If you have 4 lines out, and you’re using too light of weight, your lines are too far back. This may cause your lines to tangle, which can be very time consuming and annoying. So I ALWAYS use a 2-ounce weight in the front of the boat, even when shallow. This keeps my bait at a 45-degree angle, and away from rods at the back of the boat. Also, if you decide to slide deeper, you’re already set up for it. Keeping this in mind keeps my line out of my buddies on MOST occasions. Lastly, forget the TINY bottom bouncers. I get it, you may want your back rods to bounce way back in very shallow water…but I only do this in dirty water anyway. If you look in my boat, I have a ton of 1, 1 ½, and 2-ounce size bottom bouncers. In my opinion, those are the only sizes you need. I do have some 3-ounce bottom bouncers, however, for extreme conditions or trolling…but I don’t use them too often. There are 2 main components of a bottom bouncer (besides the weight). There’s what I call the head, which is the loop you tie your main line too. And there’s the arm, where you clip on your fishing rig. Rigging a bottom bouncer is really quite simple once you start using it. Considering how inexpensive they are, it’s a good idea to have a variety of sizes in your boat. There really are 3 main presentations that are used for fishing bottom bouncers. 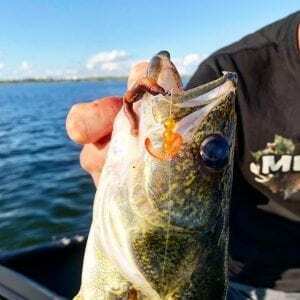 Bottom Bouncer Spinner Rig – This is basically the most popular walleye rig for walleye fishing, historically. It consists of a blade that creates flash in front of your bait. You can buy from a HUGE assortment of spinner rigs available online, or you can make your own. The main thing to think about is what size is the spinner blade? The slower you plan to fish, usually the smaller the blade you want to use. Spinner blades that are large require more speed to “spin” and create the necessary flash. Small Colorado blades, for example, are popular because they can turn in slow speeds. Also, you’ll want brighter and flashier blades in dirty water, and natural or metallic blades for clear water. You’ll want to be ready to rig up in a hurry if you break one off. Bottom Bouncers with Slow Death – The Slow Death Walleye Rig has been a major game changer this past decade with its appearance on the scene. A prime example is when fishing one of my home waters, the infamous Lake Sakakawea in North Dakota. Traditionally, bottom bouncer spinner rigs were the rig of choice but NOW it’s the Slow Death Rig that gets the nod most of the time. Fishing slow death is quite simple. It usually involves a leader and a slow death hook (I prefer the Death Roll by Matzuo). The leader length depends on speed and water clarity. The slower you’re going, normally the shorter the leader. I see guys all the time with these super long leaders going slow but all they’re doing is snagging up the whole time. You’re just dragging them. Also, you should have 2 swivels at each end of your line to avoid line twist (so annoying). MOST bottom bouncers come with a swivel on the arm, so you’re covered there. But on the hook, you’ll also want a small barrel swivel. This is another reason why I like the Matzuo brand hooks because they already have them on. If you want to learn more about fishing slow death, check out the video below. Don’t forget you can use Northland Butterfly Blades in front of your slow death hook for a different combination. Bottom Bouncer with Crankbaits – Another method for fishing bottom bouncers is to use a long leader and a crankbait behind it. I LOVE to use this presentation when fishing breaks or ledges, where my depth changes a lot. The key is to use a floating crankbait, like the Rapala Original Floater #13 or the Swithwick Rogue. You can use the bottom bouncer to go up and down the contours with the bait floating just off the ground. Bouncing the lure off bottom rocks and such can be deadly. I don’t use this method for trolling flats, however, I tend to use snap weights or leadcore instead. If I’m fishing crankbaits with bottom bouncers, I’m typically going around 1.5 to 2.5 mph. There are times when I go faster, and you can learn why at our walleye trolling guide. When I’m fishing bottom bouncers with spinning rigs, I tend to go around the 1 to 1.5 mph zone. When I have small blades I can go slower, as noted. Whenever I’m fishing slow death, I’m usually going 0.6 to 1.1 mph, which is on the slowest side. And like all presentations, there are exceptions to go faster. The key is to match the speed and presentation based on the mood of the fish. When they’re aggressive I will go with spinner rigs or crankbaits. When they’re finicky the slow death rig puts in a lot of work. I do lean more towards using slow death rigs with bottom bouncers more than any other bottom bouncer presentation. It’s just the hottest rig right now most of the time where I fish. So there you have it, a complete 101 of fishing bottom bouncers. I hope you learned from it, and if you have any questions…feel free to post them in the COMMENTS section below. I usually answer the same day (unless I’m fishing). Tight lines and take a kid fishing!